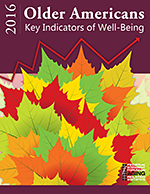 This report provides the latest data on the 41 key indicators selected by the Forum to portray aspects of the lives of older Americans and their families. It is divided into six subject areas: population, economics, health status, health risks and behaviors, health care, and environment. Single copies of this report are available at no charge through the Government Printing Office (GPO), while supplies last. Order your free copy now from the Government Printing Office (GPO) by email, or by mail using the address below. Please note that delivery may take up to 30 days. Copies may also be ordered by calling 1-800-232-4636 or by emailing cdcinfo@cdc.gov. For information about the Forum or the "Key Indicators" Chartbook, please contact: Traci Cook (301) 458-4082 or by email agingforum@cdc.gov.